Sky blue, white and silver are classic colors that convey a sophisticated quality to your invitation. Pre-printed sky blue seashells are accented with silver and gold pearls to add a simple and luxurious detail. Each invitation is wrapped in a translucent velum envelope, and secured with a sheer white, iridescent ribbon. 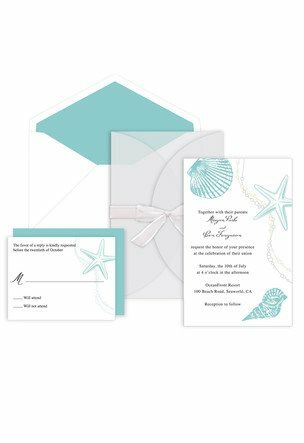 Reply cards include the starfish. In some cultures, the Starfish can be seen as a celestial symbol and, as such, represents infinite divine love. Each card includes a corresponding sky blue envelope. Outer envelope is white on the outside and lined in sky blue. To add that final touch to your package, each set has a sheet of silver adhesive hearts to use as an envelope seal. All Invitations can be personalized at home with laser or inkjet printers using the manual feed paper tray of your home or office printer. 25 Invitations - 5 1/2"x8 1/2"
25 Reply Cards - 5 1/2"x4 1/2"